Newcastle University’s engineering faculty recently did a study into the thermal properties of rammed earth. 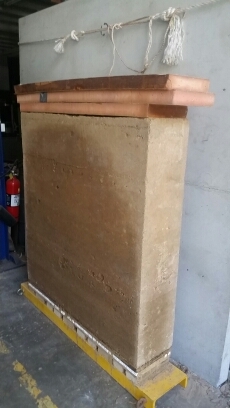 Earth Dwellings constructed a unstabilised rammed earth wall and Hillary Wong, under the guidance of Dr Michael Netherton, tested the wall in a hot box to determine the thermal properties of rammed earth. Rammed earth is often classified in terms of it’s R value, which is it’s steady state, or how it responds to a singular temperature change. In real life, the daily temperature changes dynamically, hot in the day, and cold at night. So test were conducted using a dynamic thermal analysis which gives a T value. Read Hillary’s FINAL Report here. This shows the true value of rammed earth especially when used with good solar passive design ! ← Cheap, tough and green: why aren’t more buildings made of rammed earth?